Steeped in history, breathtaking scenery, with an abundance of wildlife. Easterhoull Self Catering is the perfect base for your unforgettable holiday to the Shetland Isles. Ideally situated not far from the shops, restaurants, castle and museum in the fishing village of Scalloway, yet both far enough into the countryside to make the most peaceful evenings and high enough to enjoy views of the island speckled voes and the ocean. Pick any point of the compass to follow and Easterhoull has something to offer. The centre of Scalloway is only a quarter of a mile away and, to make things easier and more enjoyable for visitors, purpose built steps direct from the chalets to the bottom of the hill have been put in place. Situated in Scalloway are 2 licensed grocery shops, post office, hotel and excellent fish shop, which offer a wide choice of provisions. The local hotel offers a good selection of meals including seafood freshly caught each day. With a central location Easterhoul Chalets are the ideal base for visitors who want to do a bit of exploring. The main town of Lerwick is just 5 miles away where you can find a range of shops, restaurants,hotels and visitor attractions. For those without transport, Shetland offers a good public transport network with local buses passing at the top of the road just yards from the chalets. There is no shortage of opportunities for those looking to be adventurous or active. The costal location supports sea fishing and sailing. For the keen fishermen, if sea fishing is not for you, Shetland has over 300 freshwater lochs where wild brown trout are there to test your skills. For bird lovers, Shetland hosts some of the most renowned seabird colonies in Europe. Birds such as Puffins, Guillemots, Razorbills, Fulmars, Kittiwakes and Shags can often be spotted on the cliffs of Shetland. For wildlife lovers Shetland is a brilliant place, all year round, to spot many different species such as seals, otters, porpoise and if you are lucky, killer whales. The rugged terrain offers endless opportunities for walking. If you want a challenge, why not try the hill behind the Chalets. Shetland offers some of the finest walking in Europe. The combination of dramatic coastal scenery, lochs, deserted beaches and hills galore. The walker has the rare opportunity to discover ancient historical sites, dating back to Neolithic times, observe a wonderful array of wildlife – flowers, birds and mammals. Golf is well catered for with 3 interesting and challenging courses located throughout Shetland. With the long daylight hours, you can keep playing til late through the night. Shetland has long been known as a paradise for anglers, with literally hundreds of lochs to choose from. Throughout the islands you can find abundant, hard-fighting brown trout and, if you're lucky, sea trout too. Fish average around the half pound mark, but many lochs contain much bigger trout, with fish over 4lb not uncommon. Much bigger fish have also occasionally been caught. Because Shetland lies closer to the north pole than any other part of the British Isles, it’s the best place to see the ‘Northern Lights’. Over a typical winter, a keen observer checking the skies on every clear night could certainly expect to see the aurora several times. The Shetland Folk Festival, which has been organised annually by volunteers since 1981, has an international reach and reputation. Although fiddles do feature prominently, the range of music on offer is always eclectic and has included bands such as Awatinas from Bolivia and Hanggai from Mongolia, not to mention a remarkable list of North American, European, African and Indian performers. Just 200 meters along the road from the chalets, our garden is open to the public under the Nation a Garden Scheme (re named Scotland's gardens). 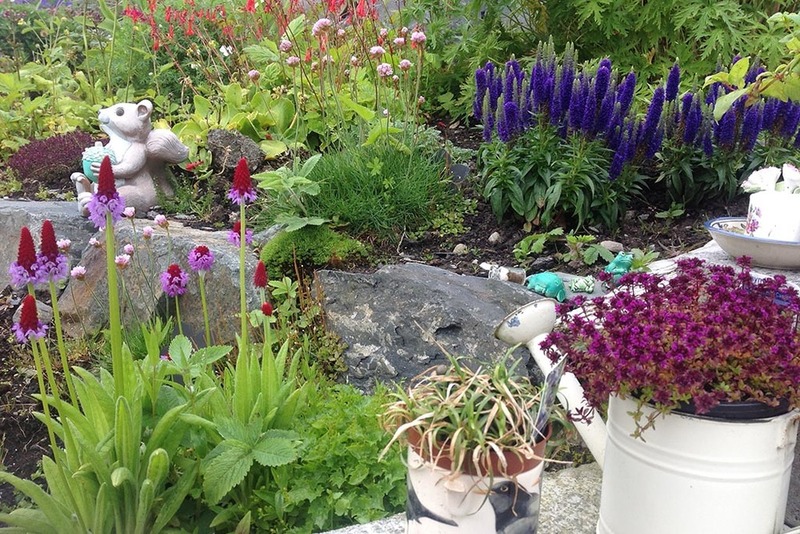 Our garden won an environmental award in Nov 2014 and is available to chalet guests to enjoy. It is 1 acre in size and has 2 ponds, veg plot, greenhouse and shetland designed Polycrub. The restaurant/café is a comfortable and affordable way to have a meal or snack, in its new modern interior the restaurant has a seating capability of 36, with a working fire place which uses one of the original chimneys. Or why not just relax in the armchairs with a light lunch or with a cup of coffee/tea all coffee's are made to order.